Reference: Daniel H. Ortega. ‘En Cada Barrio’: Timocracy, Panopticism and the Landscape of a Normalized Community. Culture Machine 8 (2006). 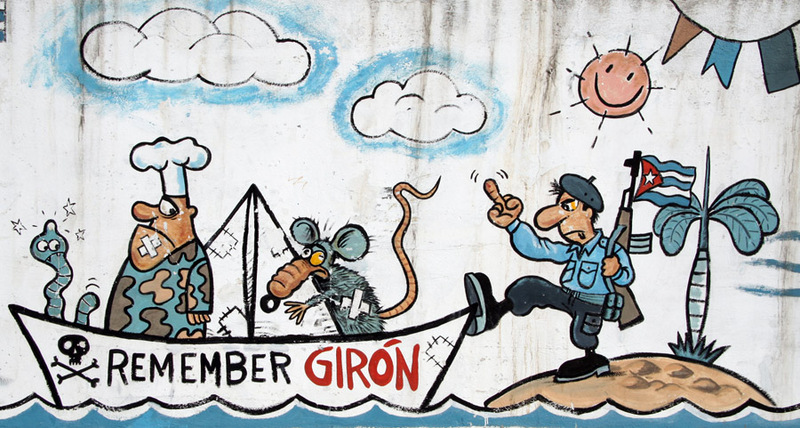 I’ve been working on a book about the political billboards, murals, and graffiti in Cuba, and have been to the island three times (2006 – 2009) to take photographs. I first heard about these political billboards at the Visual Culture Conference at Kansas State University in 2005 in a presentation by Daniel Ortega, whose point at the time had been to comment on the strong architectural presence of the billboards (called murales in Cuba) on the physical landscape. In his article “En Cada Barrio,” Ortega develops that emphasis into a theory of Cuban political power and the formation of national identity. In my own writing on Cuba—with the working title The Revolution Continues—I have been attempting to take a relatively neutral position on the content of the billboards, to see them as classic examples of visual propaganda promoting the values, heroes, challenges, and aspirations of the socialist revolution to both Cubans and tourists alike. Ortega challenges that analysis, and I want to review his argument here because it has merit, and complicates my own approach in productive ways. Ortega provides a brief history of Cuban independence movements to set up his argument that history, as displayed in the billboards, provides a scaffold for the Cuban timocratic society. Timocracy is defined as “a state in which the love of honor, glory, esteem is the highest ideal and the ruling principle of government; a state ruled by leaders of honor, worth, competence, and esteem as opposed to class, heredity, power, [and] privilege.” In Cuba, of course, contributions to independence and the socialist revolution count more than wealth, and thus the landscape is populated by images of such heroes as Manuel de Cespedes, Antonio Maceo, Maximo Gomez, Jose Marti, Fidel and Raul Castro, Camilo Cienfuegos, Che Guevara, and many others who embody Cubanidad (Cuban-ness). These are the people who fought for independence, and the people should aspire to be like them and to be ruled by people with similar virtues. The notion of Cuba as a timocracy may help to explain the longevity of Fidel Castro’s leadership and the gradual transfer of power to his brother Raul and other old guards of the Revolution—there are few others who have the equivalent revolutionary credibility. Ortega writes, “[T]he reverence held for these leaders extends beyond ideological teachings and becomes a substantial part of the Cuban landscape, as images of the heroes are reproduced on billboards, in murals, and in sculpture found throughout the country.” This cult of leadership additionally performs the task of forging a Cuban national community: “[T]hese public images act as a common voice…” and suggest who is a worthy member of the community and who is not. Ortega views the occurrence of ad hoc signs and graffiti mimicking government propaganda as evidence of community normalization and a demonstration of Negri’s notion of “multitude” as a “broad horizon of subjectivities” that seeks to “transform the world.” The singular expression does not dissent from the normalized community, but rather adds another subjectivity to that multitude. 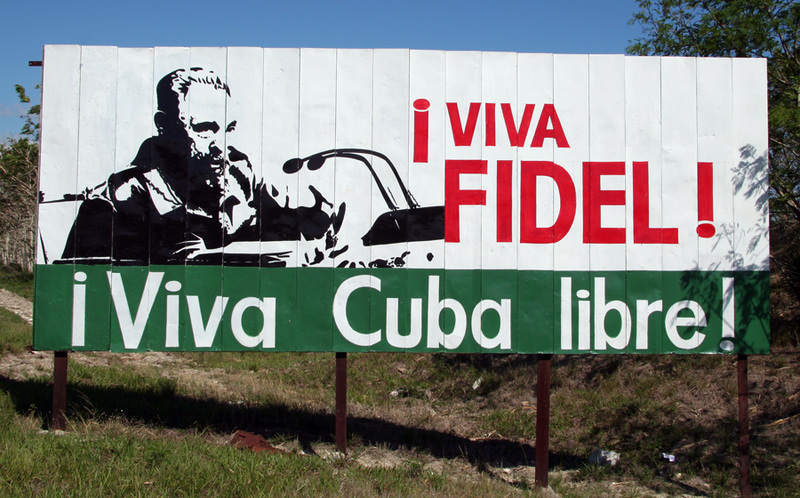 As well, these ad hoc signs complicate any judgment that Cuba is a top-down culture: “The implication that politically oriented graphic materials …reveal a set of cultural values imposed by those in power, suggests the formation of a visually oriented, ‘top down’ (Marxist) ideology. However, a closer reading asserts Foucault’s suggestion that power can also be transmitted in an ascending fashion.” The top down messaging of the billboards and murals encounters an upwards force of ad hoc signs and other activities of the CDRs to forge community and national identity, as well as affirm governance models. Without being a Cuban national, it is difficult for me to confirm or challenge Ortega’s argument, though it appears to have considerable merit. However, as a tourist and researcher who has traveled extensively in Cuba on different occasions, I believe I can add another perspective to Ortega’s conclusions. It is not frivolous to suggest that the extensive network of billboards and murals adds colour and interest to the Cuban landscape in much the same way that local murals in Canada or the U.S. illustrate the community’s history, values, and aspirations. As tourists to Cuba, we are brought into the national dialogue, not only about the timocratic state and the maintenance of revolutionary watchfulness, but also about the issues that concern Cubans and what they want the world to know about. The network of murales is newsworthy. This is propaganda as education for outsiders to the community. Unlike Cuban citizens, tourists are not being asked to accede to the power of the state in the long run. That these murales are prolific along the main route between Havana and Jose Marti International Airport and along the Via Blanca between Havana and Varadero suggests that tourists are a significant audience for their messages. blockade”] Given on-going attempts to isolate and discredit Cuba by successive U.S. administrations and the Cuban exile community, getting the message out to the world is animated by a tone of urgency and indignation. This message to the world relies on visitors to become the medium—taking home their stories and photographs—and asks for justice in the court of international public opinion. This further function of Cuban visual propaganda does not contradict Ortega’s analysis so much as open it up for further dialogue. How Barbarous! A terrorist goes free. This entry was posted in Propaganda and tagged Cuba, Ortega, panopticon, propaganda, timocracy. Bookmark the permalink.